Dentures are removable, artificial teeth that are typically made from acrylic. They restore your ability to eat properly, improve your speech, and help support your overall facial structure. Teeth can be lost for a multitude of reasons, including decay, gum disease, or through involvement in an accident. In cases like these, J.B. Dental in Westminster can expertly construct a complete or partial denture to restore your beautiful smile! Complete and partial dentures are the two types of permanent dentures available to return the beauty and functionality of your smile. Partial dentures are used to replace missing teeth and avoid a shift of the surrounding teeth due to the space left by the missing tooth. Complete dentures are used when all the teeth are missing from either the upper or lower arch. Temporary partial dentures keep patients from being toothless while more permanent dentures are being made. Dentures are made with materials that make them light, durable, and easy to adjust to while still giving you complete functionality and support. Each material chosen for your specific denture will be customized to best suit your needs. Partials made with a cast metal framework for strength are best for patients who are missing several teeth, but whose remaining teeth are healthy and solid in the bone. For those concerned with aesthetics, J.B. Dental offers a Valplast® partial with all tissue-colored clasps and no visible metal. J.B. 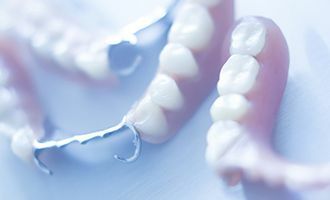 Dental offers many options including our more affordable standard dentures, as well as premium dentures which provide the highest quality of appearance and comfort. We will design your partial denture to look like your natural teeth so that your smile appears seamless. Getting a denture requires several appointments to ensure the appliance is best fitted to you. First, molds or impressions must be made to gather precise measurements and provide you with a denture perfectly fit to your mouth. Once the fit, shape, and color of the denture have been matched to fit your smile, you will have full dental functionality and a truly beautiful smile. Dr. Bancroft will guide you through all of the care instructions to best treat your new dentures, including the hygiene habits you will need to preserve them and maintain your optimal oral health. Proper cleaning and maintenance of your dentures is essential to prevent infection or other related issues. While our dentures are strong and long-lasting, changes in your mouth and normal wear may require them to be periodically adjusted. To avoid discomfort or damage to your appliance, please contact our dental office immediately with any questions or concerns regarding your dentures.